This past Saturday, I had the opportunity to spend a day working with the staff at Arthur Elementary School in the Oklahoma City School District as part of the U.S. Department of Education’s ConnectED initiative—a program that has provided 1:1 access for every student and staff member on campus. In the past, I have wondered how schools such as Arthur Elementary School are selected. What attributes made them one of only 114 schools nationwide, as well as the only campus in Oklahoma, to receive the iPads? After facilitating the day-long session, which included staff members analyzing lesson plans, completing inter-rater reliability exercises, conducting self-assessments, and creating new learning experiences based on the H.E.A.T. (Higher order thinking, Engaged learning, Authentic connections, Technology use) instructional model, my question had been answered. The professional manner in which individual staff members and grade level teams converse with one another—along with their collective vision and willingness to reach group-generated goals relating to 21st Century learning—was truly remarkable. Current survey results showed the majority of the AES staff at a LoTi 2 (Exploration), which makes sense given the quick turn-around for receiving the iPads and initial PD. Yet, a year from now, my bet is that the majority of staff will be on the cusp of a LoTi 4 (Integration). The faculty's unified approach could even be seen as you walked the halls of the school, where each classroom door was adorned with its own H.E.A.T.-themed design. 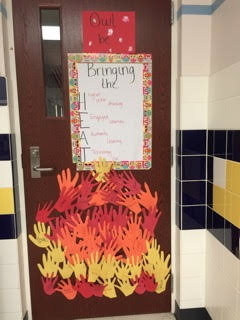 The doors serve as a daily reminder for students, parents, and staff of the school's vision for using digital resources to promote high levels of student engagement, collaborative learning, and authentic problem-solving.